Approximate Dimensions: 16" x 24"
You don't have a functional stove without proper insulation. 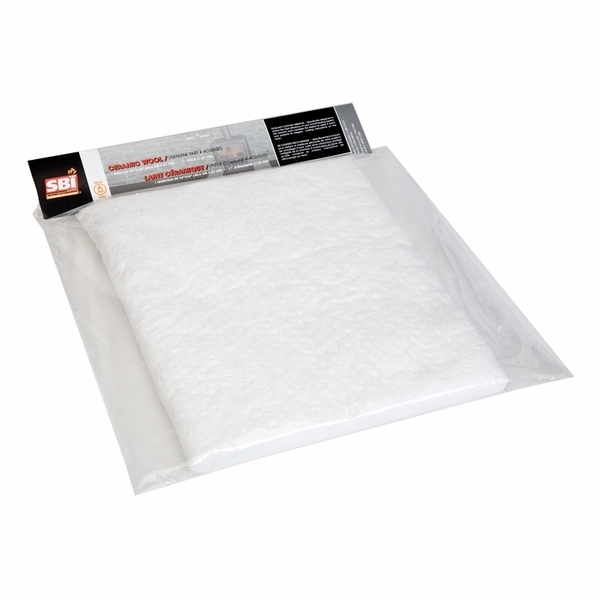 Prevent heat from escaping, and keep your stove's heat where it belongs with this 1/2 Inch Thick Ceramic Wool Insulation from SBI. This material insulates stove fireboxes, giving a hedge of protection that maintains efficient and effective operation for years to come. This Ceramic Wool Insulation measures approximately 16" x 24". Trust SBI for the finest stove accessories, materials, components and more for your home or business. Can this be glued onto the inside of a cast iron ash door? This material is designed to insulate between layers of steel or cast iron. It can also be used on the backside of firebrick or ceramic baffles. However, it is not intended to come into direct contact with ash or embers and will deteriorate rapidly in that case. If you want to insulate the ash drawer, I would only apply this material to the outside of the drawer, if it will not interfere with its operation. Otherwise, it would be better to line the drawer with vermiculite panels.